A week after it was smashed by super typhoon Haiyan, Tacloban, Central Philippines, is a city in shock. The wall of water which his as the storm surged has left the city of 220,000 in ruins, without essential services, in short, in a state of profound crisis. There’s no food, precious little water, no health services, no schools, and the military is enforcing an 8pm to 5am curfew across the stricken city. The smell of corpses is pervasive, which together with the wrecked buildings makes for a bleak and depressing picture. Against this backdrop, aid agencies are racing to bring in vast amounts of shelter, food, water, healthcare and other relief items. Communications are patchy, fuel is in short supply, but the top need in Tacloban today is information. 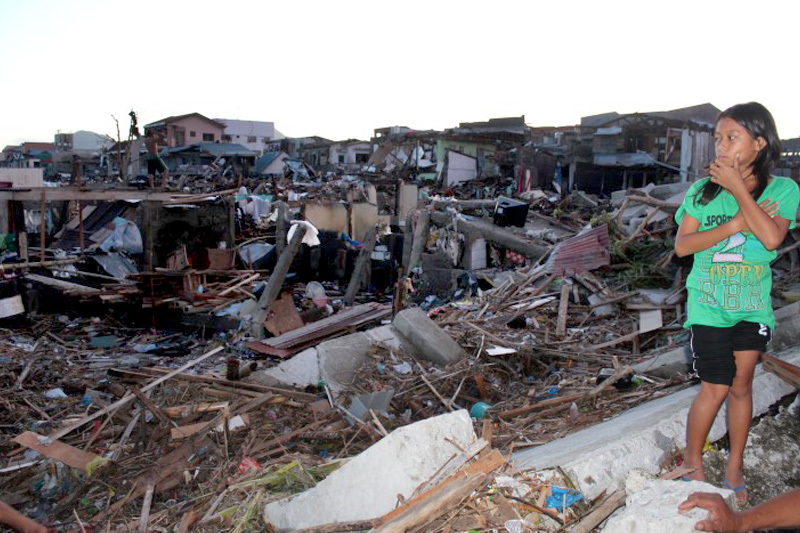 No one yet knows how many people perished in the hours that Haiyan lashed the central Philippines. Or how many survived. Local government, the backbone of any massive aid operation, is barely functioning, resulting in complete confusion. What is sure is that hundreds of thousands of people are sheltering in schools, churches, community centres and in makeshift shelters, growing more desperate as each hour passes. IOM has vast experience in dealing with the aftermath of typhoons, and is rushing experienced staff to the heart of the affected area. The Organization is already hard at work on the ground, piecing together a picture of where and how many people have been displaced, as well as managing what will be a $21.5 million aid operation. It is mustering all its global resources to respond to what the United Nation’s has designated a Level Three disaster, putting it on a par with the international response to the international crisis in Syria. At the Astrodome, a 5,000 conference centre which served as a shelter for Tacloban city during the storm, some 2,500 people are reckoned to be living, in conditions that are getting more insanitary by the day. Garbage is piling up and the smell of excretion is evident. An IOM team visited the centre on Thursday morning, and found that not only had no aid been distributed, but that no one had taken charge of organising people. Questions about leaderships, organisation, numbers, were met with blank looks. That was when Rezalino “Jury” Dos Santos took charge. A veteran of previous typhoons, he knew just what was needed. He quickly assessed the crowd of people gathering around him, and selected three people as ad hoc camp managers. Tearing sheets out of his notebook, and handing out pens from his pocket he told his new charges to make a list of everyone at the centre. This is the heart of IOM’s Displacement Tracking Matrix, in use in crisis zones all over the world. Aside from getting vital information, is also gives people a sense of responsibility and a say in controlling their own destiny, Ophelia Casio epitomizes this. The 46-year-old mother of eight signs u two of her 20-year old daughter and within an hour they have a list of 90 families. His words ring true, as eight people are reported to have been crushed to death in an unsupervised distribute of rice on Wednesday. IOM has also convened the shelter and Camp Coordination clusters, and together with the government will put systems into place to ensure that tents, tarpaulins, shelter kits, solar lights, windup radios and other non-food aid reaches the hundreds of thousands of people in immediate need. Joe Lowry, IOM Spokesperson for Asia and the Pacific, with Humanitarian Coordinator Valerie Amos during her visit to Tacloban this week.